If you’re interested in setting up your own business, we can help you achieve your goals through a tailor-made programme that will run alongside your regular studies. Meet alumnus Richard Hungerford and find out more about his success as en entrepreneur in this video. Watch Copenhagen MBA students develop their business ideas in the MBA Accelerator. Developing an entrepreneurial mindset is critical, whether you want to create your own business or work within an established company. You will learn to recognise and analyse opportunities – using yourself and your potential business idea as a starting point – with a view to turning your concept into a real venture by developing your model and business plan. The Advisory Board, or A-Board for short, pairs you up with real startup companies where you will act as an adviser on genuine business issues. Your new-found MBA skills will help the entrepreneurs to develop their companies, and you will assist them in making important decisions and clarifying their vision and mission. The MBA Accelerator is a highly practical elective in the Entrepreneurship Track, designed to prepare you for starting your own business or create innovative projects within an existing company. The course includes short motivational lectures but is primarily driven by you and your fellow students – in conjunction with mentors, experienced investors, researchers and entrepreneurs – as you develop a business idea into a business development plan. In the MBA Accelerator, you will build you knowledge about business models, market development, prototyping and business platforms, and by the end be able to craft a business development plan and pitch your idea. If you are particularly interested in entrepreneurship and want to continue their engagement in this space more deeply, the Copenhagen School of Entrepreneurship (CSE) is located on campus and offers a thriving community of entrepreneurs. The CSE has an ecosystem of entrepreneurs, angel investors, venture capitalists, legal advisers and other specialists, and you are able to receive advice on everything from proof of concept to valuing your startup. After completing the Copenhagen MBA in 2012, Richard Hungerford went back to Vancouver to launch a startup in the technology space. He grew it from a team of two to twelve in 18 months and in that time period his company was acquired by Hootsuite. Hear Richard's story and find out more about his success as en entrepreneur in this video. 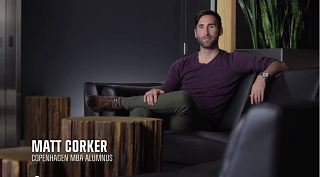 Vancouver-based Matt Corker is an author, a performance coach and part of the product team at Lululemon Athletica. 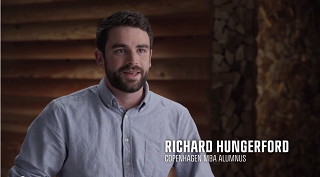 Hear why he chose the Copenhagen MBA, why he loved living in Copenhagen and what kind of skills he took from the MBA experience in this video.